I never wanted to get married. Yes, I was that woman. My mom loves to tell stories of how even when I was a little girl I would bemoan about how much more women do than their husbands, and how they were never even thanked for their work. My bridesmaids and I! Choosing the right women to surround you is key to a successful, and sane, wedding. Photo by Samier Mansur. As an adult I became more adamant about this decision to never marry, mainly because the marriages I saw around me growing up in Bangladesh just expected women to compromise and sacrifice more than their male counterparts. I also witnessed a lot of bad marriages, or bad matches, I should say, since most partnerships around me were made in a culture that only believed in arranged marriages. Even after sister after sister of mine got married, I stayed determined not to give into the pressures and questions about when I was going to put on my traditional red and gold wedding sari. In my mind, being single and having freedom was the best marriage a girl could have. Soon after finishing college, I left the States, moved to Italy, got my Master’s at Sussex, and started to work in London. I had already made a commitment: to myself. You could say my parents had all but given up on even trying to move me in the direction of domestic bliss. So when I got engaged last year at the age of 29, needless to say people were um, taken by surprise. Meeting my now- husband and deciding to take that leap was something that we both talked about and thought about at length, between ourselves before we let any family or friends enter the conversation. It made me realize that I had never wanted to get married not because I did not want to be married but because I never thought I would never find the right partner. I had convinced myself that the right spouse for me did not exist and could not exist. It was almost a defense mechanism of sorts. But when the dust settled from the news of the ultimate feminist, aka me, tying the knot, what really bothered me was how people assumed that by getting married I was no longer a feminist. People had decided that I could not be both. After all, how could I be a married feminist, right? The two belief systems contradicted each other in the minds of so many I realized that I was confronting one of the worst stereotypes still out there: that if you’re a feminist you hate men. Not only is this untrue, but many, many well-known women who identify as feminists are or have been married, from women’s rights icons such as Gloria Steinem, Eleanor Smeal, Kim Gandy and Jessica Valenti to feminist-declared actors such as Nicole Kidman or Ashley Judd. The list goes on and on. Of course you can be a feminist and get married. You can even be a Muslim feminist like me and get married. I think the difference is how you get married, and having key feminist themes and elements incorporated into your wedding. There was no doubt once I agreed to marry my husband that my wedding was going to be big, fat and feminist. What was feminist about my wedding? For starters, I had it at the National Museum of Women in the Arts. After my brother-in-law read the passage on marriage from the Koran, which emphasizes equality in your union, I was asked in front of the whole wedding party if I accepted my husband’s hand in marriage three times as is required in Islamic ceremonies. And in keeping with Muslim tradition, I did not change my legal name. I also had an entire table of my colleagues from the Feminist Majority Foundation at the wedding. You could say we were well represented. 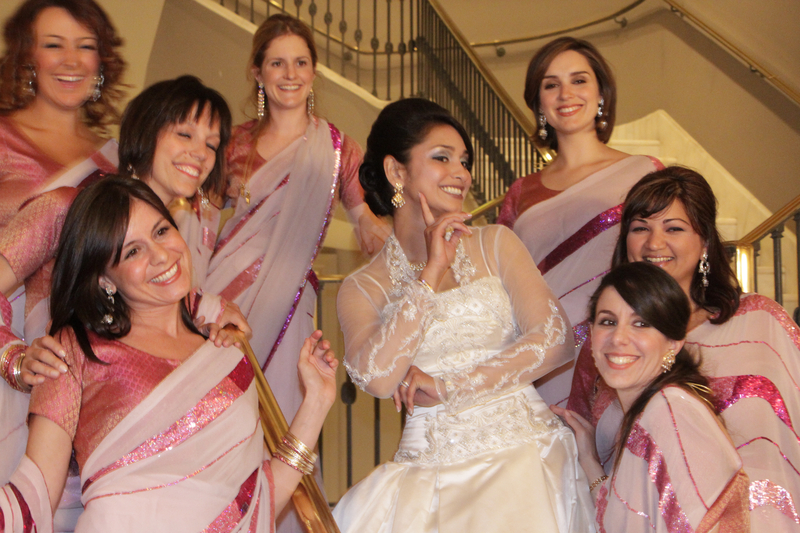 Being a staunch feminist also helped when I was maneuvering my way around the American bridal industry, something as a Bangladeshi I never imagined I would have to do. This entire business is built around exploiting women’s insecurities and anxieties. Midway through wedding planning I got a kidney stone, fell gravely ill and lost 20 lbs. The women working to alter my dress thought this was great news and worked hard to convince me how important it was that I keep this weight off so I could effortlessly slip into a sample-size gown. I walked straight out of that store and into the closest Mexican restaurant I could find. The wedding industry is also centered around making you buy a lot stuff for your wedding that you don’t really need. Do you think your wedding guests really want a personalized pearl and diamante heart-shaped framed picture of you and your husband to take home? Seriously? The most important feminist aspect about my wedding was the decision I took to get married in the first place. I married when I wanted, how I wanted, to the man I wanted, when it was right for me. Everything happened under my terms and in my own time. After all, when feminist icon Gloria Steinem got married at the age of 66, she made me see that feminism is really all about making the right choices when it is right for you. *This post of mine was also published on Forbes Woman, Ms. Magazine & The New Islander. Next PostHappy Birthday, Anushay’s Point! I too identify as Bangladeshi American, feminist, activist and never wanted to marry since I was a child (I also have your name but a different spelling!). I’ve been with the same man (African American – not Deshi) for 6 years, and often feel the pressures from ‘the Aunties’ to marry, but I just don’t want to! My parents don’t come from arranged marriage and they have never pressured me, but the whispers and pressure from ‘the Aunties’ can get so severe sometimes that it stops me from going to different functions (the few that I used to go to). What is interesting now is that since I have been with him so long, all my girlfriends keep asking me when I plan to get married. I’m happy with the partnership and commitment that I have now. I have no desire to get married and I wonder if marrying will just be another example of me practicing heterosexism. Thank you so much for writing this piece. I love your personal touches and I believe all women can identify with you on this matter. It is so refreshing to hear a story of a women that stands up for what she believe, and not catering to others ideas of “what you should be” to me that is the true mark of being a feminist! I love your spirit and that you know your own mind. Thank you for writing this. I’d love to link to this on my blog, I, Muslimah, if you wouldn’t mind. I’m a Muslim convert and a feminist and your example is an inspiration to me and all “sisters” (of all kinds). Thank you so much, Ellen for your kind and generous comment. Of course you can post it on your blog! Just make sure to list that it was cross-posted from Anushay’s Point. Thank you! Anita, thank you, means so much to me to hear these words from you, a great woman I admire tremendously. Thank you for being such a strong role model to all women and girls! There’s so much more to life than stressing about the one day where (and lets be honest) it will finish faster than you eating a tray of cupcakes!!! We are all complex beings, its possible to be two contradicting things at once. I dont like labels, so I dont say im a feminist and like you I was so sure that i wasnt going to get married. This is my 2nd read to same post, the former was when i followed the link to Ms.Magazine, where i think the same thread is a little massive, but i felt like commenting directly on your personal page. Well, I’m not only amazed but You’ve portrayed my point of view about “feminism” and all the debates I’ve ever had amongst my mates supporting the Idea and describing it not only as Freedom of Choice for Women but their need in male dominated world, which, Infact is basic right to every individual. and since religion “Islam” designs same “Thought” It has equalized status of man and woman, and given equal rights and liberties to both, where punishments as well as freedoms are alike, Islam, even goes on further entitling respect to womanhood, their rights in inheritance, freedom of choice, a prominent status within family as well as in society. You’re doing great work, All the best.